Terex Corporation has entered the wood chipper business through the acquisition of Woodsman LLC, a Michigan-based manufacturer of wood processing equipment. The Woodsman product lines will be integrated into the Materials Processing segment of Terex. The business has a comprehensive line of hand-fed chippers as well as a portfolio of biomass chippers. Terex will be using a number of well-developed distribution channels to make sure that the particular needs of customers for both hand-fed and biomass chippers are met effectively. The business will be showing its Terex Woodsman 440 biomass chipper, which is equipped with a 50” diameter by 45” wide full pocket cutting drum, and the Terex Woodsman 730, a compact hand-fed machine for customers seeking a compact chipping solution, at various shows this fall. Wood-Mizer Products Inc., manufacturer of both portable sawmills and industrial-grade stationary sawmills, now offers the Small Log Processing (SLP) line. The SLP is a series of products that work together to improve industrial efficiency, and consists of the Twin Vertical Saw (TVS), Single Vertical Saw (SVS), a single or multi-head horizontal resaw, material handling for loading and transferring, and an EG300 MultiRip Edger. The system can be set up in a conventional, in-line arrangement for maximum efficiency or it can be set up modularly for convenience. The TVS features two tilted heads, which remove the slab from each side of the log. Then the SVS, which also features a tilted head design, splits or removes the third side from a two-sided cant as it comes off the TVS. From there, the horizontal resaw recovers as many boards as possible. Lastly, the EG300 MultiRip Edger standardizes up to three board sizes for maximum timber recovery. 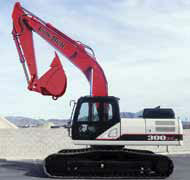 LBX will introduce five new Link-Belt X3 series excavators over the course of 2011. 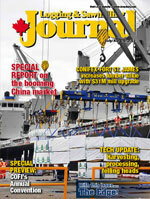 The introductions began in March with the debut of the 250-, 300- and 350-class machines at ConExpo. Mid-year, a 250 long-front and 470-class excavator will be made available. The X3 series full-sized conventional models have been completely redesigned with an all new ROPS certified cab and interior, new interim Tier 4A engine technology and up to 10 per cent better fuel efficiency, more lift capacity, faster cycle times and improved serviceability. Renowned for fuel efficiency, dependability and quietness, Link-Belt says that the advanced, electronically-controlled Isuzu diesel engines in its new excavators have a reputation for providing more work per dollar of fuel than the competition. Isuzu engines deliver unparalleled performance and power to respond to peak demands of heavy digging and lifting applications, according to the company. The new family of engines powering the X3 series is EPA certified to Interim Tier 4A standards. WSM Biomass Super Shredders combine the efficiency of a high-speed mill with the durability of a heavy-duty grinder. Available with rotor widths from 60” to 88”, these machines deliver higher tip speed for smaller, consistent fibre sizing, increased screen area for more throughput and flexible/interchangeable tooling. The largest WSM Biomass Super Shredder—the massive model 4888S—features a 48” by 88” long rotor, and operates with 400 to 800 hp to convert high volumes of pre-processed biomass materials. The Super Shredder has superior production rates of up to 100 tons per hour, eliminating the need for multiple machines. WSM Biomass Super Shredders include AR interior wear liners, modular sizing screens, dual pivoting hydraulic housing, and reversible/replaceable hammer tips for reduced maintenance and operating costs.